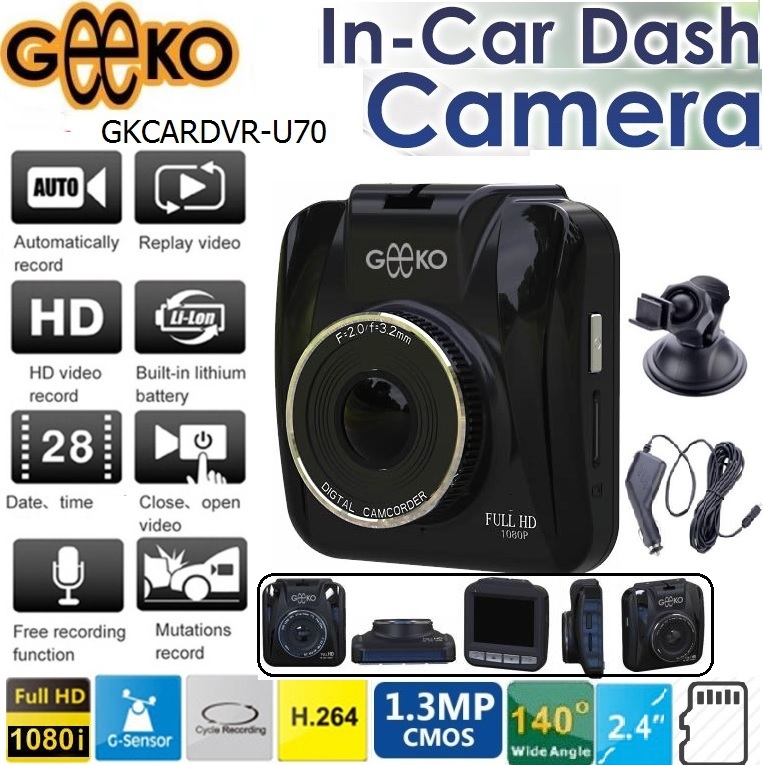 The Geeko VR-Box / Shinecon Virtual Reality 3D Headset Glasses with Bluetooth Remote Controller also known as the Shinecon Virtual Reality Headset 3D Glasses is specially designed for Android and iOS based Smart Phones from 4.5inch to 6.0 inch for you to journey into a new way you watch movies and play games. 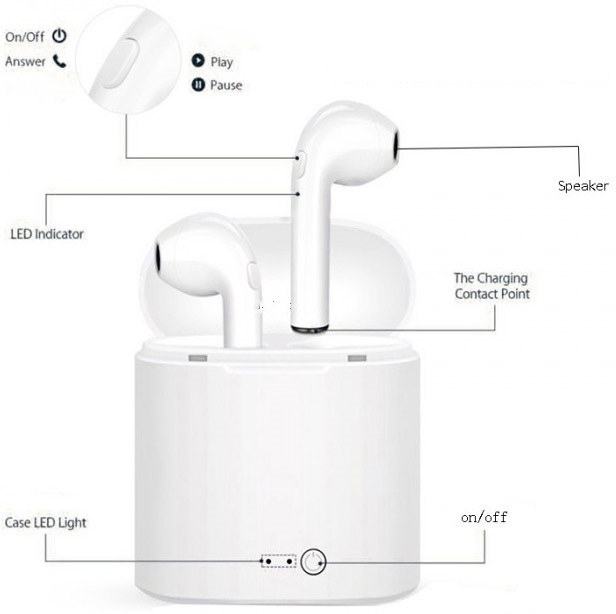 This headset combined with your smartphone gives you access to immersive 3D videos, games, and augmented reality, it is like having your own very private 3D Cinema and also gives you a great gaming experience in complete privacy. The Flexible, adjustable headband suits most head sizes and thanks to the specially designed resin lenses, there won’t be any dizziness or visual fatigue even if you wear it for extended periods of time. 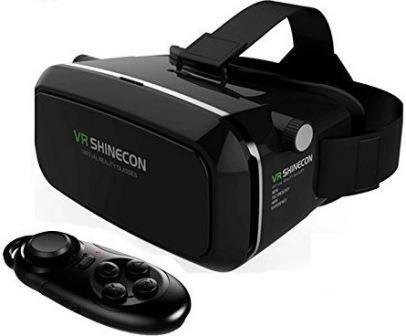 The Shinecon / Geeko VR Virtual Reality 3D Headset can be worn with eyeglasses, and has ventilation ports to prevent fogging on the lenses. 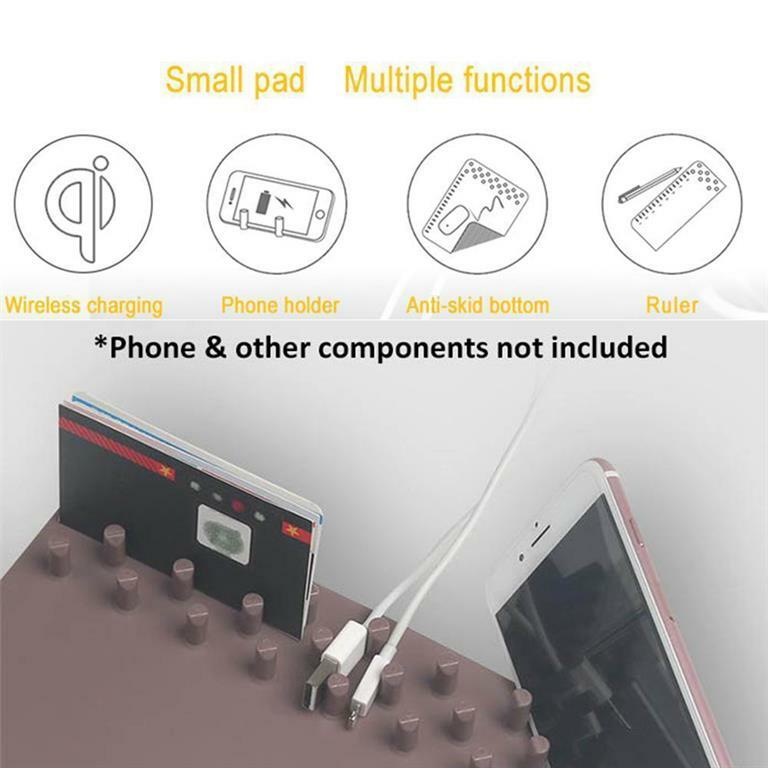 It is easy to use by children and adults alike all you need to do is download movies , games and applications on your smartphone and slide your smartphone into the customised slot on the Virtual Reality 3D Headset and new worlds open up to you ... in addition, it is equipped with a Bluetooth remote controller for controlling selfie, music, videos and game, etc. which can bring you much convenience. 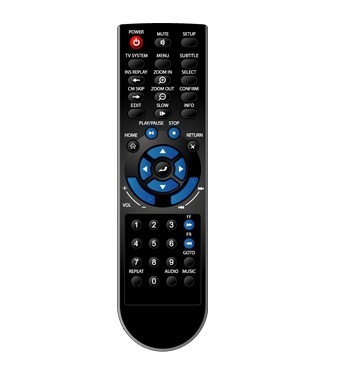 The included Bluetooth remote control is compatible with Android 4.2 and above and iOS 9.2 and above, however with iOS offers limited functionality but with Android it supports all the functions. •Light weight and compact, easy to carry. •Easy to put smart phone into the 3D Headset glasses. •3D Glasses uses high-grade Sponge, more fit for your facial outline when you wear it. •Wonderful experience of watching movies and playing games. 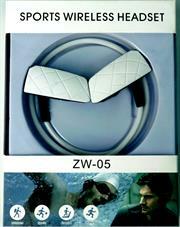 •Flexible and adjustable headband is suitable for different people. •Adjustable pupil distance and sight distance, convenient to use. •Don’t feel visual fatigue and dizzy with the resin lens even use it for a long time. •Simulating viewing distance: Offer you a 1000 inches big screen at the distance of 3m. •High-precision lens provides a clearer picture and a better view. 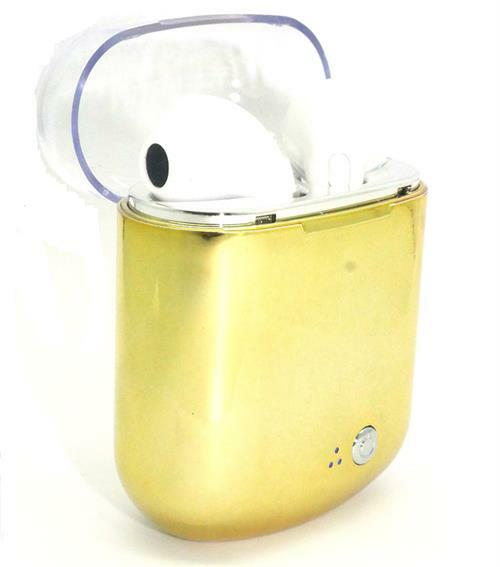 •Allowing you watch at any time anywhere whether sitting, lying or standing. •Great companion for traveling or staying house. 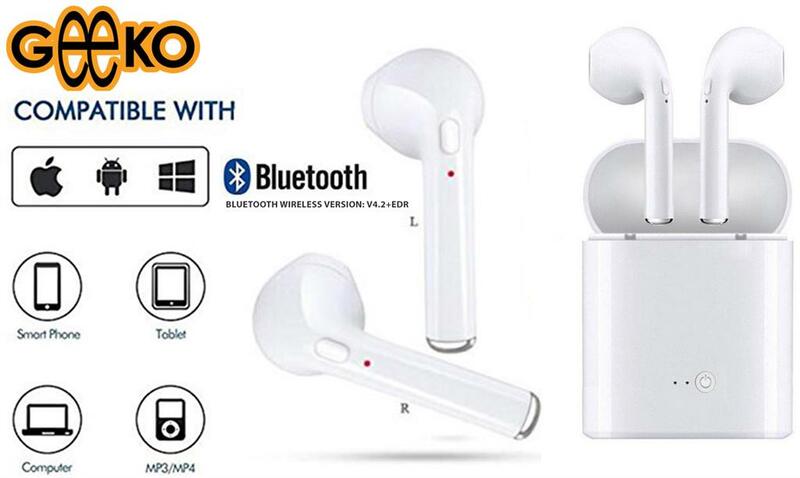 •Only can look at the left-right 3D film (Support Android and iOS Smart Phones). 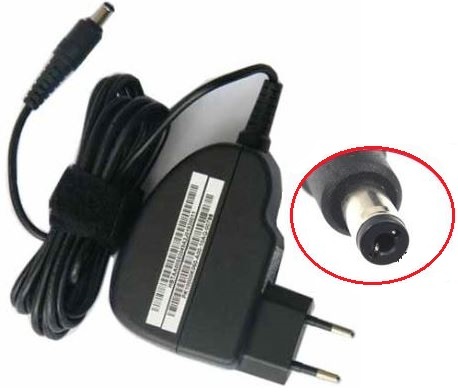 •Both sides holes of the 3D Glasses is specially designed for the cable of headset and other suitable external devices. 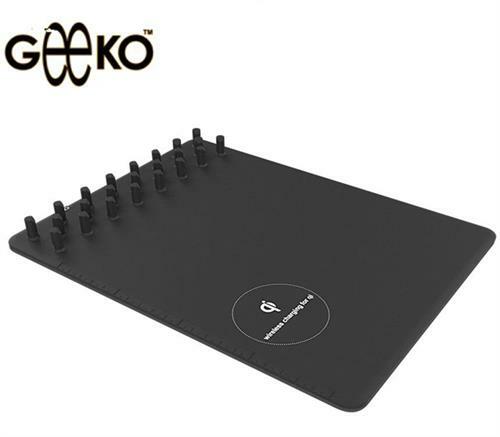 Geeko Smart WCDMA Mobile 3G Portable Wifi Hotspot Router with 2100mAh PowerBank- Lightweight and Portable, Share Internet Connectivity with up to 5 Users , Working Time up to 5 Hours, Provides wireless access up to an averaged 7.2 Mbps for downloads and 1.5 Mbps for uploads speeds , Retail Box, 1 year Limited Warranty. 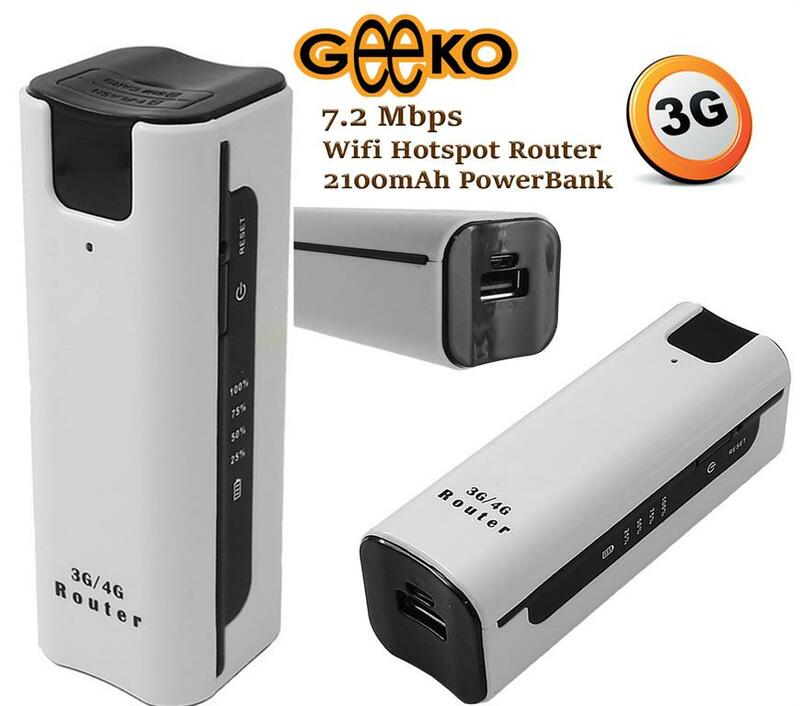 The Geeko Smart (Unbranded)WCDMA Mobile 3G Portable Wifi Hotspot Router with Sim Card Slot and 2100 MAh Power Bank provides wireless access up to an averaged 7.2 Mbps for downloads and 1.5 Mbps for uploads speeds when you travelling or at home to share and manage data with colleagues or family members. 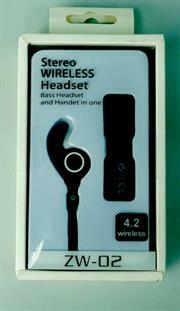 Wireless access is available via the 3G network . Up to 5 users can access the Wi-Fi network at the same time. 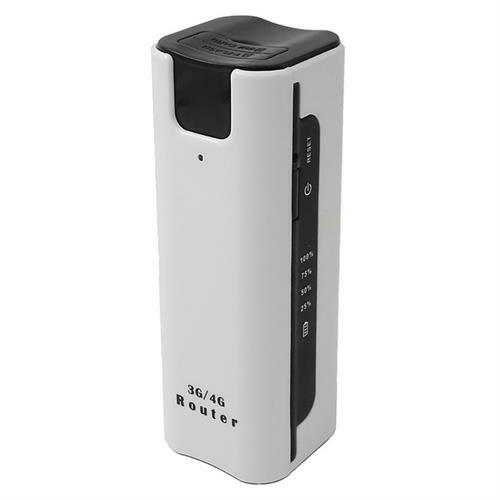 Works with battery 2100mAh and Compatible with WCDMA HSPA/GSM networks , can also be used to connect with Tablet, Laptop, notebook and different types of Wi-Fi devices. 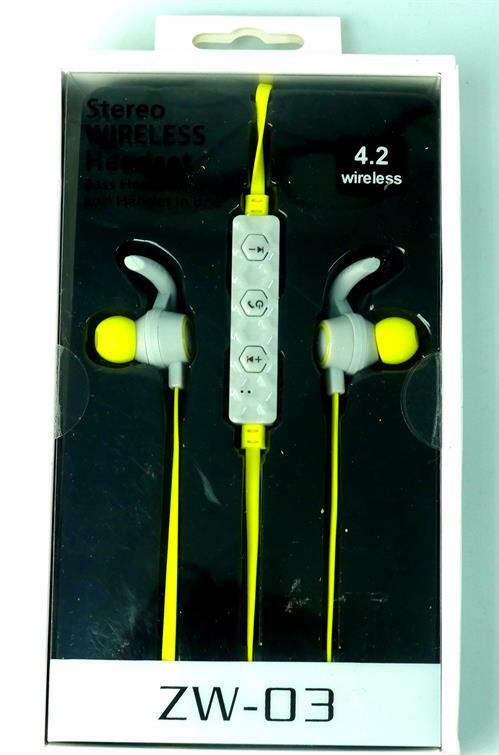 Please Note :This device is designed for 3G / GSM network – Packaging and manual is generic and does not reflect the actual product. • Based on the Android system, support APP developed. • Built-in 2100mAh battery, can be used as power bank, provide power to mobile devices. 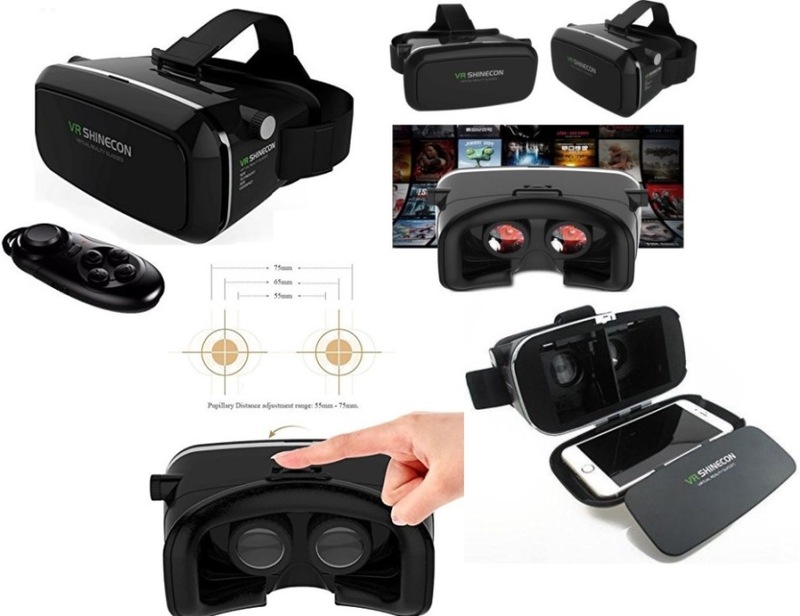 The Geeko Virtual Reality 3D Headset Glasses with Mini Bluetooth Remote Controller is specially designed for Android and iOS based Smart Phones from 4.5inch to 6.0 inch for you to journey into a new way you watch movies and play games. 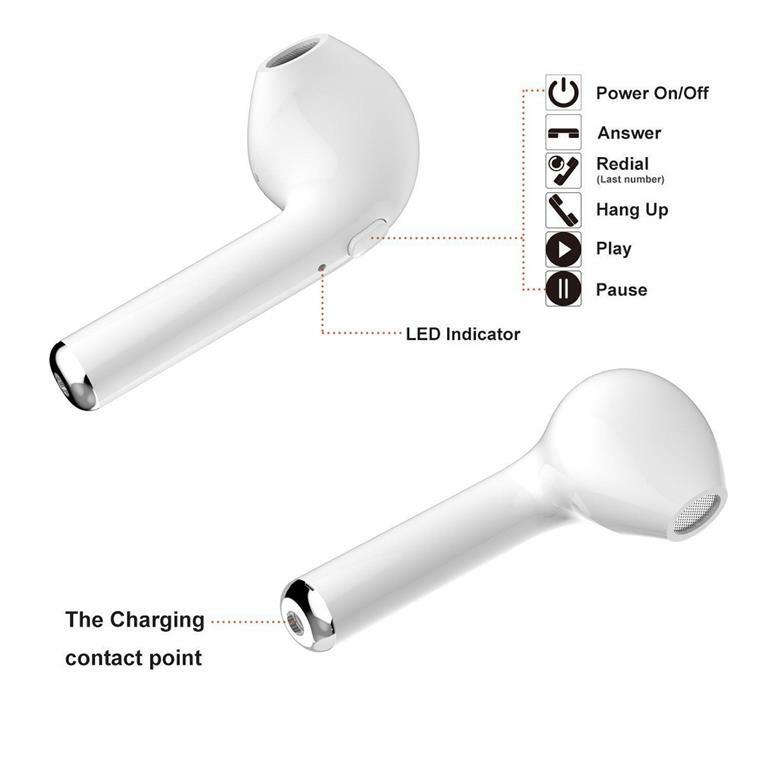 This headset combined with your smartphone gives you access to immersive 3D videos, games, and augmented reality, it is like having your own very private 3D Cinema and also gives you a great gaming experience in complete privacy. 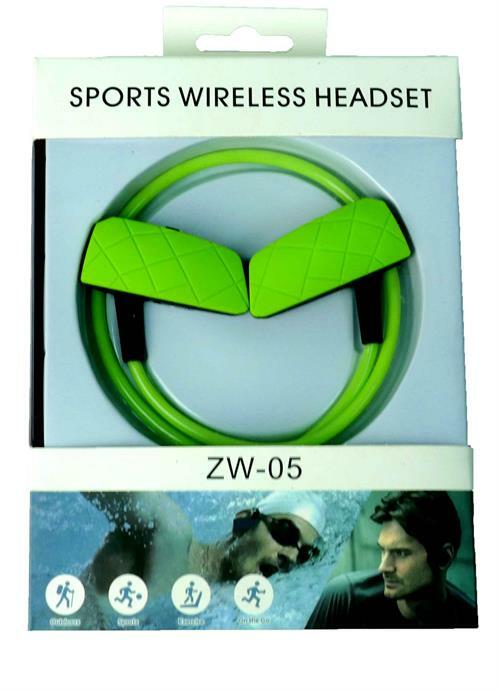 The Flexible, adjustable headband suits most head sizes and thanks to the specially designed resin lenses, there won’t be any dizziness or visual fatigue even if you wear it for extended periods of time. 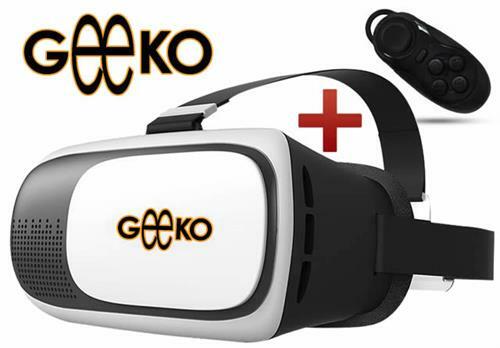 The Geeko Virtual Reality 3D Headset can be worn with eyeglasses, and has ventilation ports to prevent fogging on the lenses. However with iOS offers limited functionality but with Android it supports all the functions. 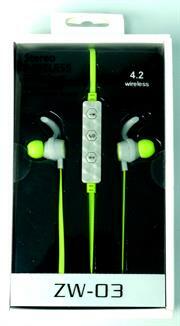 • Light weight and compact, easy to carry. 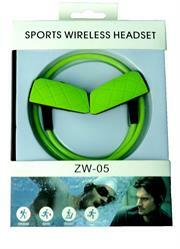 • Easy to put smart phone into the 3D Headset glasses. • 3D Glasses uses high-grade Sponge, more fit for your facial outline when you wear it. • Wonderful experience of watching movies and playing games. • Flexible and adjustable headband is suitable for different people. • Adjustable pupil distance and sight distance, convenient to use. • Don’t feel visual fatigue and dizzy with the resin lens even use it for a long time. • Simulating viewing distance: Offer you a 1000 inches big screen at the distance of 3m. • High-precision lens provides a clearer picture and a better view. • Adjustable pupil distance and sight distance, satisfying different groups of people. 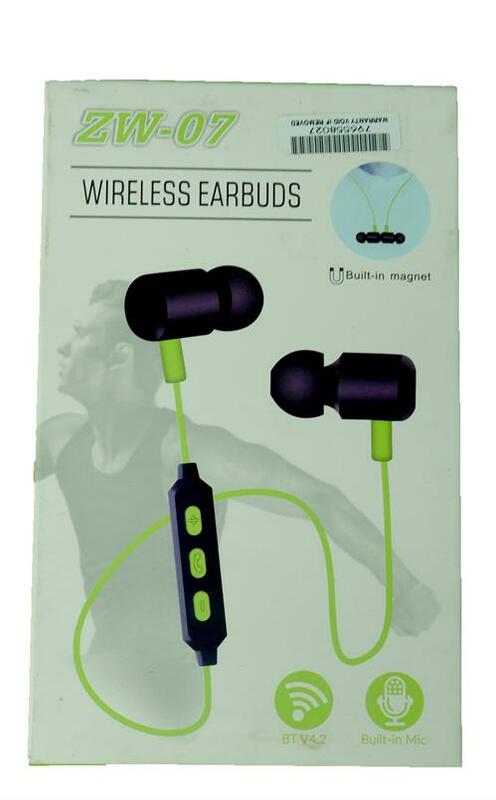 • Allowing you watch at any time anywhere whether sitting, lying or standing. 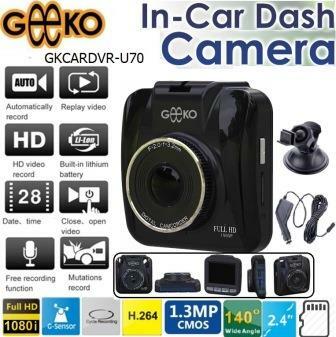 • Great companion for traveling or staying indoors. • Only can look at the left-right 3D film (Support Android and iOS Smart Phones). • Both sides holes of the 3D Glasses is specially designed for the cable of headset and other suitable external devices. 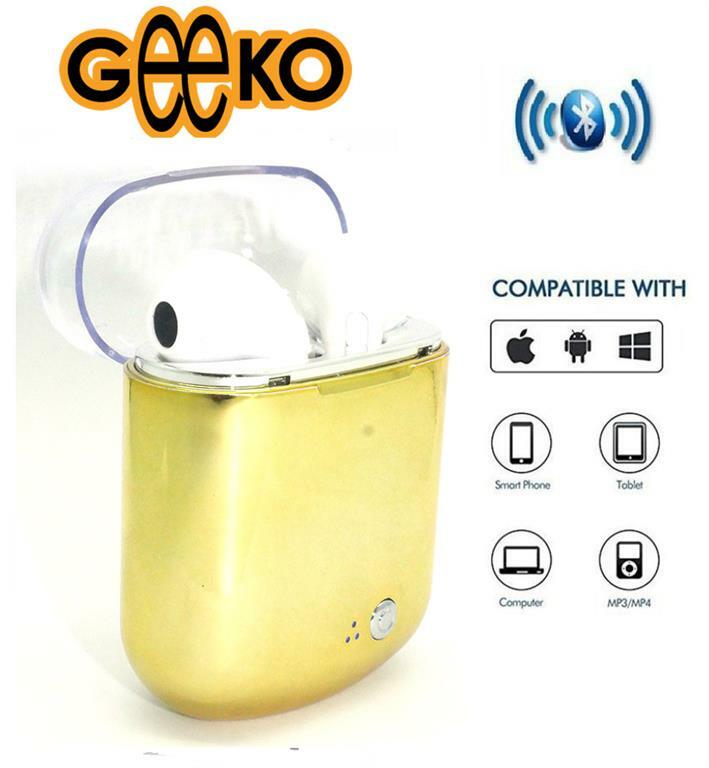 Geeko Siamese True Bluetooth Wireless White EarBuds with Gold Charging Dock and Microphone -Bluetooth V4.2+EDR , Up to 10 metres Transmission distance, Built-in 60mAh Rechargeable lithium Polymer battery per EarBud , Talk time: Up to 2 hours, Music Playing time up to 3 Hours , Changing Time: 1-2 Hours, Standby time: 40 hours, 900mAh Power Bank Charging Dock, Compatible with all Bluetooth-enabled devices, such as iPhone, iPad, Samsung, LG, Nokia, HTC, Tablets-Colour White EarBuds with Gold Dock , Retail Box , 1 year Limited Warranty, Retail Box , 1 year Limited Warranty. 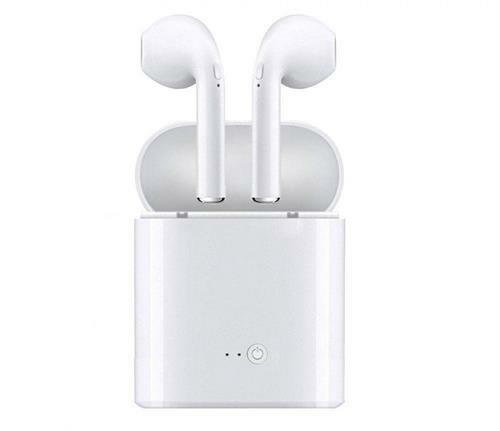 The Geeko Siamese True Bluetooth Wireless in ear EarBuds with Charging Dock and microphone includes two pieces of ear buds and each of them can work as a single ear Bluetooth headphones. 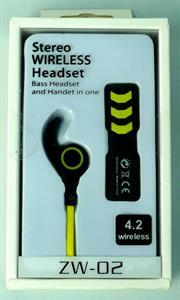 The true wireless headphones deliver crystal clear sound with powerful bass for a great listening experience. 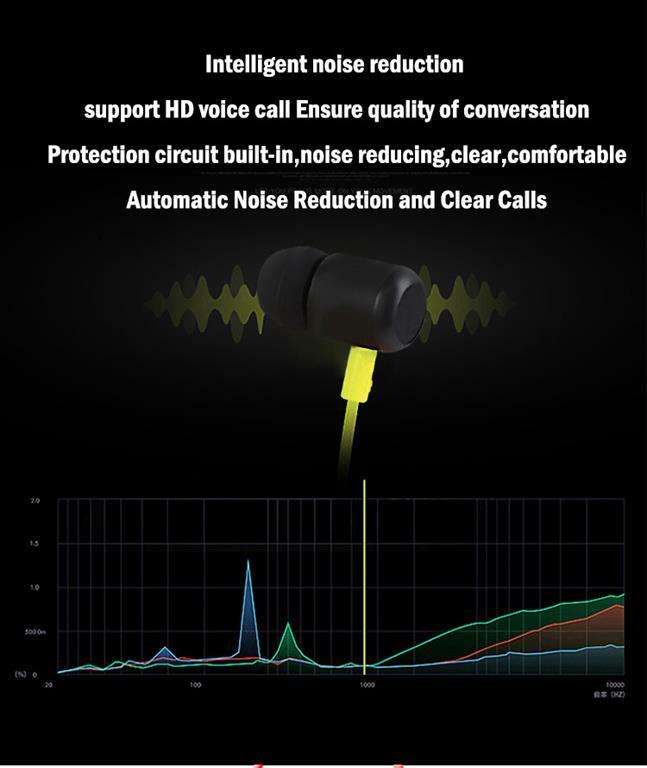 And built-in Microphone allows you to answer a call without reaching your smartphone. 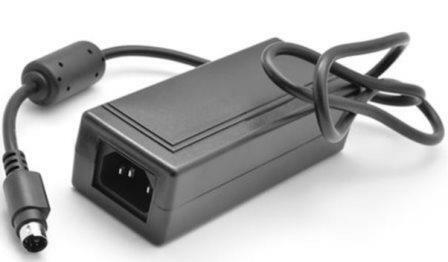 The newest Bluetooth 4.2 technology ensures quick and stable connection with your smartphone, tablet, and other Bluetooth-enabled devices. 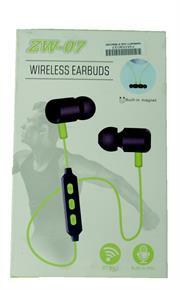 The Ergonomically shaped EarBuds provide long time comfortable wearing. 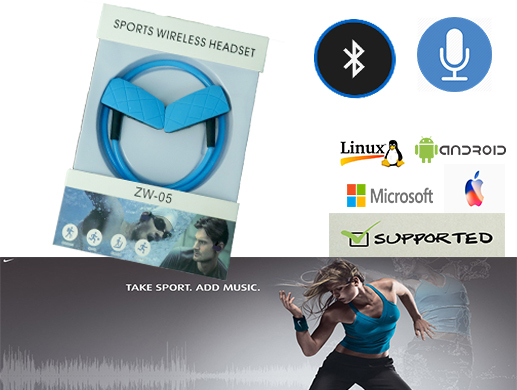 Built-in microphone makes chatting with family and friends a breeze. 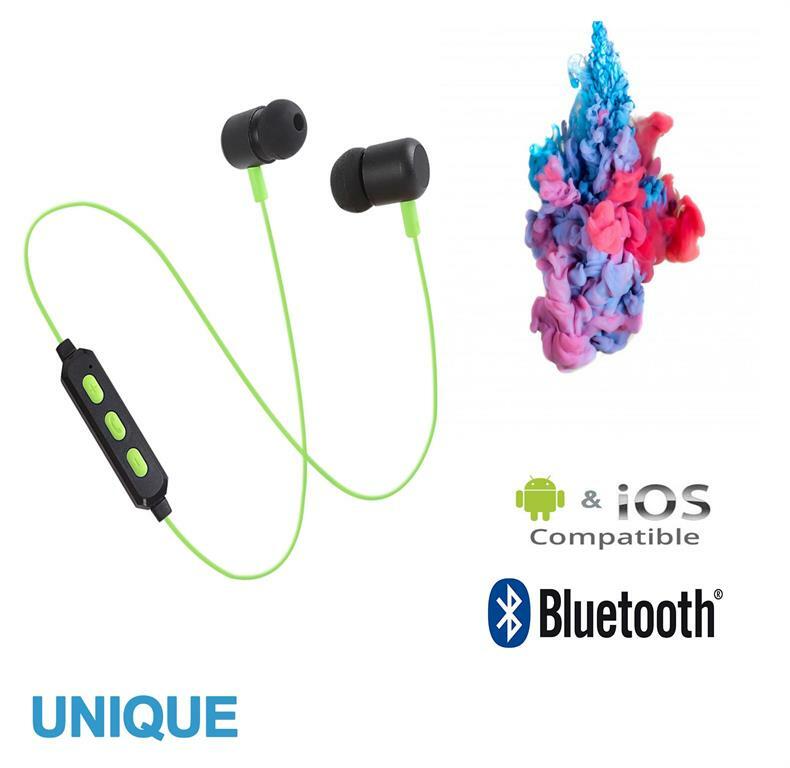 Coupled with mini power bank 900mAh charging dock allows for your EarBuds to be charged up to 4 times when you on the road or have no access to a power source. 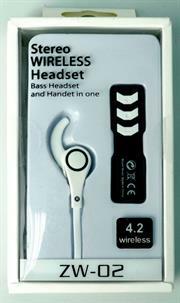 • Built-in High Sensitivity Microphone, provide clear and loud sound. 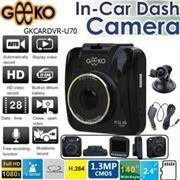 • Hands-free, allow you to conveniently answer calls for safe driving, etc. • Compatible with all Bluetooth-enabled devices, such as iPhone, iPad, Samsung, LG, Nokia, HTC, Tablets, etc. 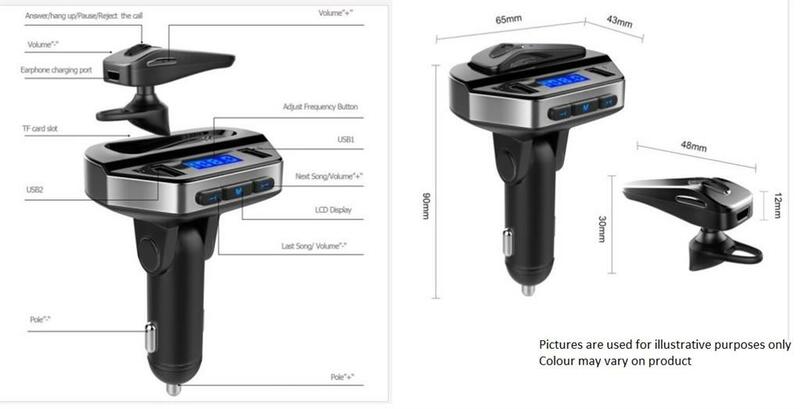 Geeko V6 (Unbranded)Bluetooth Hands Free Car Modulator Kit FM Transmitter MP3 Player with Bluetooth Earphone and Built-in microphone plugs directly into cigarette lighter socket and allows you to safely answer calls hands free while driving and will stream the audio wirelessly to your car radio , it is also a MP3 Player that allows to play your favourite music playlist or audio books that are created on a Flash Drive (not included) that plugs into the USB slot or from your phone or tablet to your car stereo system via Bluetooth, The mini Bluetooth Earphone also allows for hands-free calls for a private conversation. 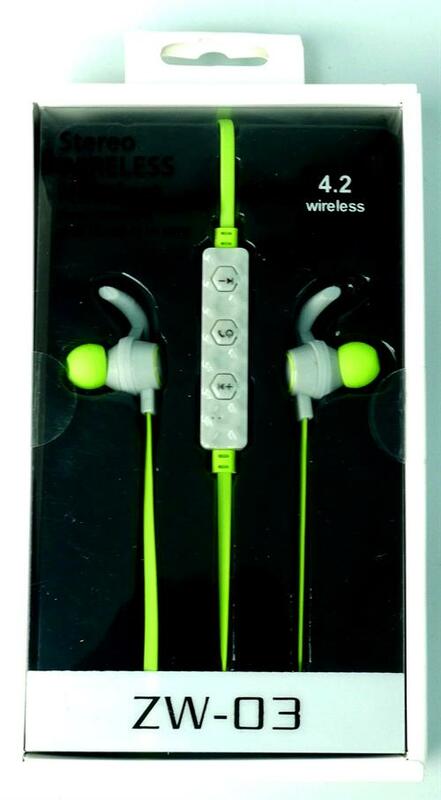 1.Power on the device, there is a prompt voice : Bluetooth is ready to pair. 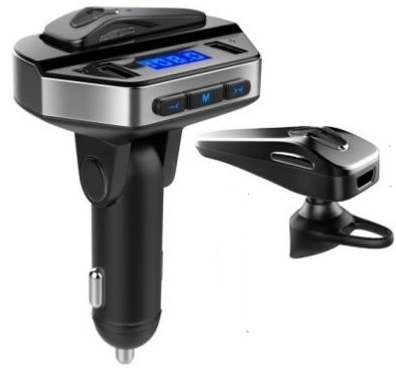 2.Turn on Bluetooth function on smart phone or tablet Bluetooth search the name of V6. 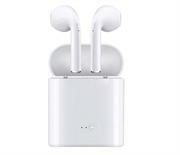 3.After connected, there is a prompt voice Bluetooth connected successfully. 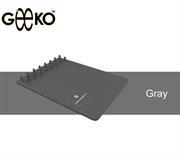 Geeko Wireless Charging Mouse Pad - Grey, Retail Box , No Warranty. This is easily the coolest mouse pad you've ever seen. thus mouse pad features 20cm ruler on your left-handed side to be kept on a desk to help in measuring and drawing.pokey keeps unruly cords, cellphone, USB memory & business cards organised. 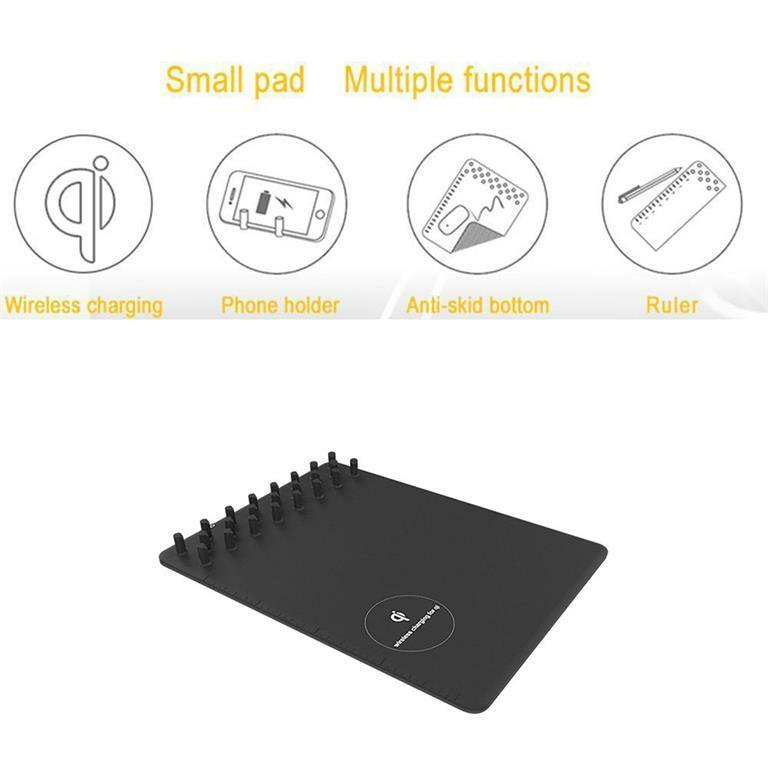 This mouse pad with a cord manager part is ideal for any constant mouse users looking for comfort. 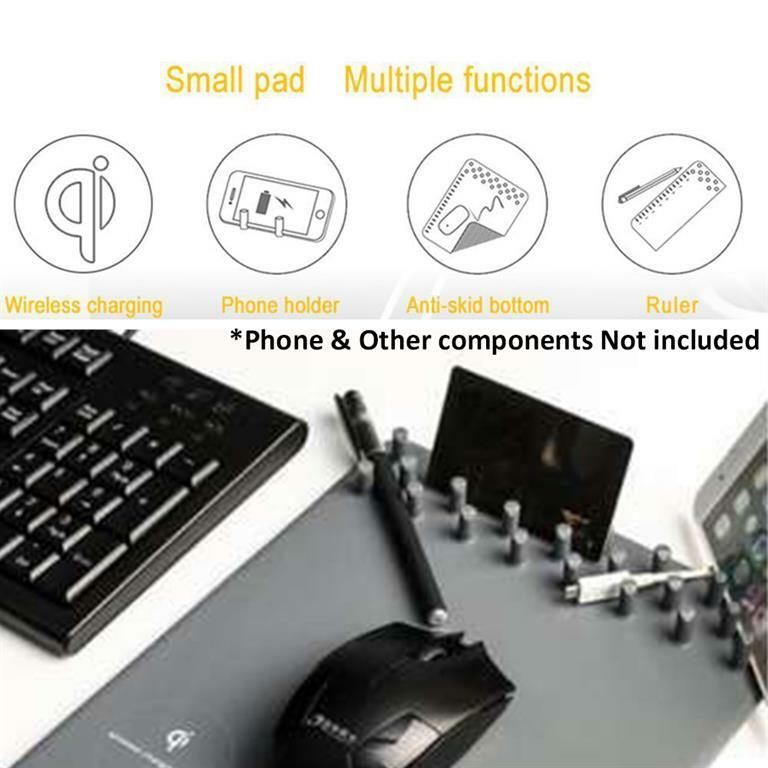 it keeps your desk very tidy that wont let anything slip such as cords and USB memory.It features an embedded pattern that helps optimize beam detection for definitive mouse pointer location and minimized cursor fade or jitter. 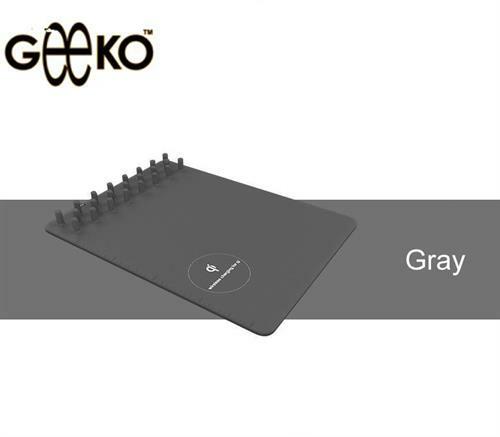 ideal for everyday use in the home or office, its special surface helps graphic designers, photographers and others. 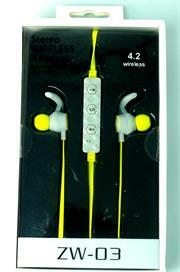 its low-friction surface provides smooth movement for long use with less effort. 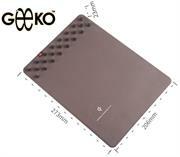 Geeko Wireless Charging Mouse Pad - Black, Retail Box , No Warranty. Geeko Akekio USB Wall Charger with 5 USB Ports, OEM, No Warranty. 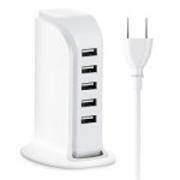 • Have 5 USB port, many electronics equipment can quick charge at the same time and convenient to carry! 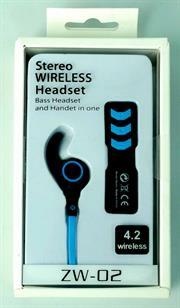 • Can be used for Pad, phone, Pod, PSP, MP3, MP4, GPS, Bluetooth, etc. • An intelligent IC chip protection system is built in to effectively prevent overcharging and short circuit it is stable, reliable and safe. You no longer need to take selfies photo with self-timer apps. 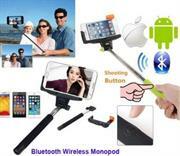 The Geeko Z07-5 Wireless Monopod Handheld Selfie Stick with the built-in Bluetooth shutter release is designed for people who like taking photos but travelling alone. Compared to the traditional tripods, the monopods for camera are easy to carry with lighter weight and smaller volume. When you travel around, you can simply put it into your backpack or handbag and take it out to mount the camera onto it to shoot photographs or videos for yourself. The length of the monopod can be extended to as long as 100cm so that you can take photos or videos from more distances or angles. 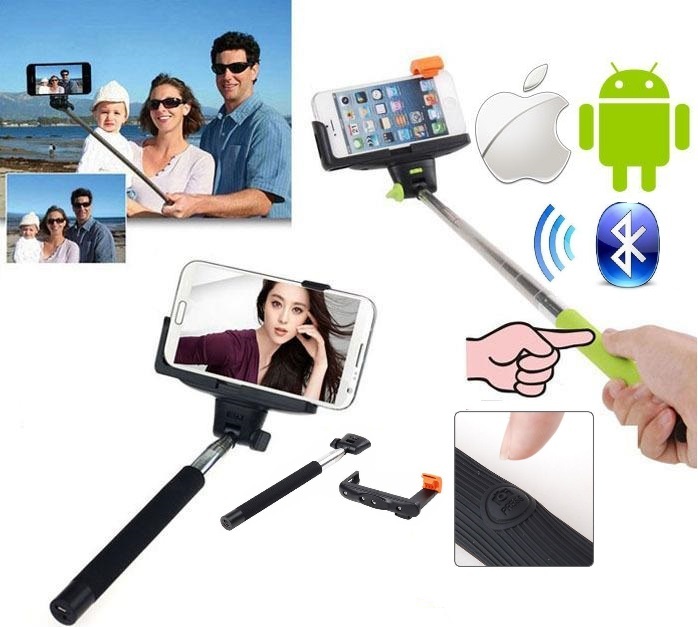 This is a must-buy gadget for social networking junkies and everyone who are bitten by the selfie bug. 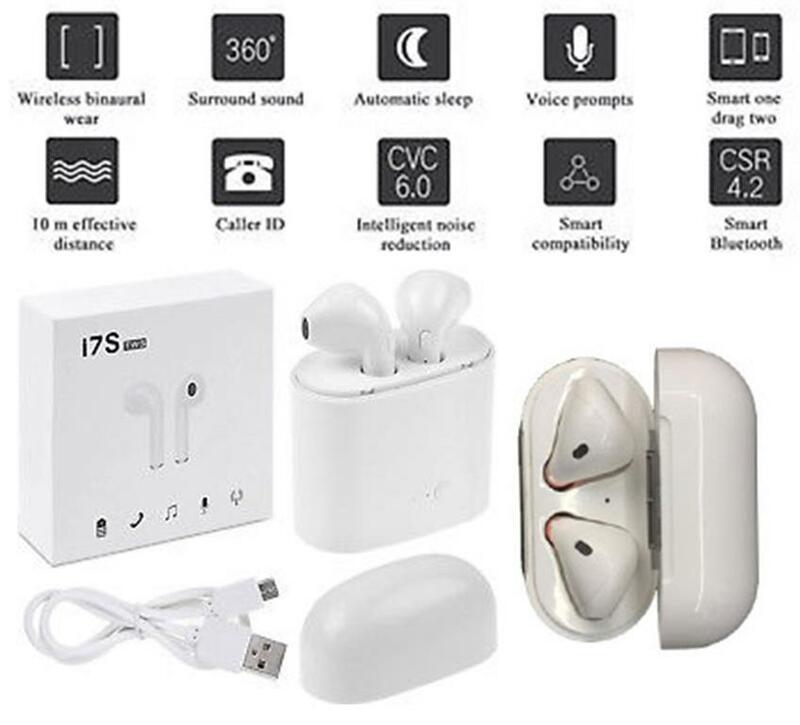 Geeko Siamese True Bluetooth White Wireless EarBuds with White Charging Dock and Microphone -Bluetooth V4.2+EDR , Up to 10 metres Transmission distance, Built-in 60mAh Rechargeable lithium Polymer battery per EarBud , Talk time: Up to 2 hours, Music Playing time up to 3 Hours , Changing Time: 1-2 Hours, Standby time: 40 hours, 900mAh Power Bank Charging Dock, Compatible with all Bluetooth-enabled devices, such as iPhone, iPad, Samsung, LG, Nokia, HTC, Tablets-Colour White EarBuds with White Dock, Retail Box , 1 year Limited Warranty.